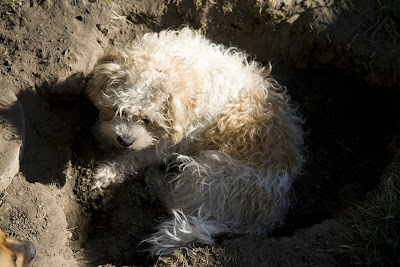 Inder Loves Folk Art: Crouton in the back yard dirt hole. The dogs insist on digging giant holes in the back yard, including in the middle of the lawn. Their purpose in digging giant holes? Well, to lay in them, of course. Duh. You mean they weren't planning a bonfire pit for our benefit? Also, the best part of that photo? Omie's nose. That little guy is so cute, how long do you have him ?